This stunningly fragranced candle produced by the Littlecote Soap Company at Skipton in North Yorkshire is lovingly handmade by their small rural team and uses traditional artisan methods and only the very best of British sourced ingredients. 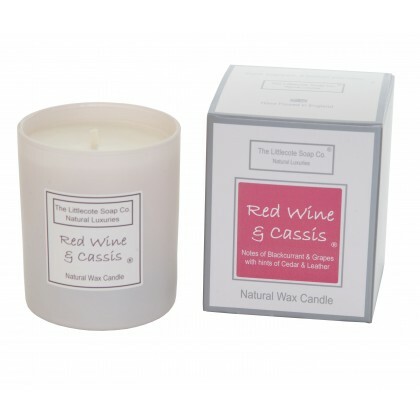 The Red Wine & Cassis Natural Soy candles are hand poured in our glass containers and fragranced with the warm blend of Black Grapes, Plum Clove & Apple on a beautiful woody undertone. The Natural Soy Wax used gives a much cleaner burn than Paraffin based candles making it much healthier too! The Burn Time is approximately 30 Hours. Scent, fragrance and freshen your room today.